The Luftwaffe used many varieties of aircraft weapon types (as well as aircraft) during WWII, among the most varied of any nation. They were constantly striving to maximize aircraft firepower against the wide variety of targets they had to deal with. Weapons fire used to bring down a heavily armed 4-engine bomber is not the same as that required to effectively deal with a fast and maneuverable fighter in a dog fight. By contrast, Allied forces were fond of homogeneous wing mounted arrays. The British almost exclusively used the .303 light machine gun and later, 20mm cannon. The U.S. quickly adopted the Browning M2 .50 caliber heavy machine gun, far and above the most common aircraft weapon used by the U.S. in Europe. 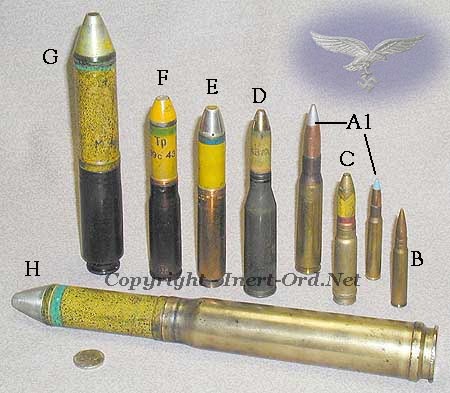 The 20mm being more common in the Pacific theater. "B" • 7.92mm Rheinmetall MG 17 - Developed in 1936, the MG 17 was suitable for synchronized cowl mounting to shoot through the aircraft's own propellor. Air-cooled, recoil-operated and belt fed it used the standard Mauser 7.92mm cartridge. Used in fighter aircraft such as the Messerschmitt Bf 109-E.
mounted position as the MG17. It continued to be used until the end of the war. "E" • 20mm Oerlikon MG FF - Developed using the Swiss Oerlikon F as a basis, the MG FF saw widespread use in many German aircraft during the early air war in WWII, most notably in aircraft such as the Messerschmitt Bf109-E and Bf110-B. Although superseded soon after the end of 1940, it provided the Luftwaffe with a formidable punch against the British, who had yet to adopt aircraft weapons beyond the .30 caliber class. The main drawback of the MG FF was its ballistic performance. Being very different from the 7.92mm MG 17 light machine guns installed on the same aircraft, the cumulative effect of concentrated fire was lost. (One of the drawbacks to non homogeneous armament.) With the development of the “Mine” shell design, this disparity was reduced somewhat. "D" • 15mm Mauser MG 151/15 - Although having high muzzle velocity, the MG 151/15 's size, low rate of fire and weight made it an impractical upgrade from the existing 13mm MG 131. However, it did provide a short term improvement over the existing 20mm MG FF cannon and was used in the Bf109-F fighter. The MG 151 was soon enlarged to 20mm caliber and quickly replaced the 15mm design. designers to progress to 30mm types, as well as continue with more advanced aircraft designs like the FW 190 which could carry more guns. "G" • MK 108 - Although having a lower ballistic performance, it was relatively light and compact. Fighters could carry two or even four MK 108s. This gun had a heavy punch and was an effective weapon to use against bombers such as the B-17. It saw late war service with aircraft types such as the Bf 109-G, Bf 110-G, FW 190, Me 163 rocket fighter and the Me 262 jet fighter. "H" • MK101 / MK103 - Initially developed to attack bombers from a safe distance, the MK 101's weight and low rate of fire relegated it to use by ground attack aircraft, such as the Me 410 Hornisse, and Henschel Hs 129. These mounted the guns in special pods or bomb bay arrangements. The MK103 was lighter than the MK101, with electric firing and a faster rare of fire. It was an excellent powerful weapon, but still too heavy to be carried by a fighter without considerable loss of performance. 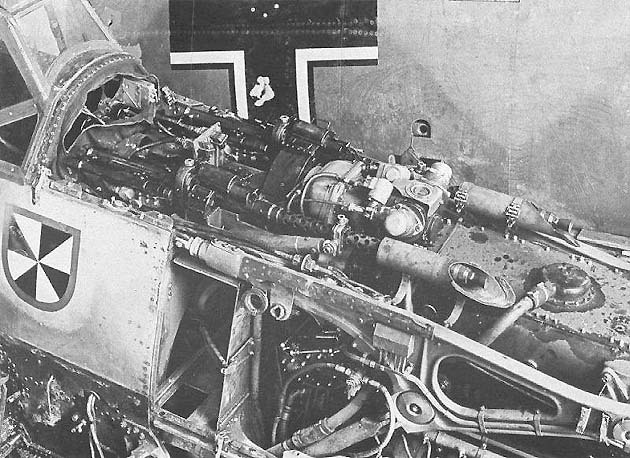 Consideration was given, the very end of the war, to mount a modified MK 103 in the Bf 109-K Messerschmitt but was never implemented. The Me 262-A Schwalbe jet fighter was evaluated using the 103 on a very limited basis.